Tabula Rasa UK – out on 23rd October! The fine folk at Bloomsbury UK have almost finished doing the mysterious things that publishers do, and I’m delighted to say that TABULA RASA, the sixth Medicus tale, should be available here from 23rd October. That’s print and ebook: I’ll put up more info about the audio when I have it. Above: writer of book set in a wet autumn on Hadrian’s Wall inexplicably chooses to publicise it with a summer photo from Ostia. Did I mention that it’ll be on sale in the UK and Ireland on 23rd October? Great Photo!! you look wonderful. The happiest of health. Thank you Lori, and all good wishes to you. I have to admit the glowing cheeks are caused by sightseeing while carrying luggage. In August. I really must learn to plan better! Oh sorry Adam, I should have made it a bit clearer! Congratulations! As you may or may not know, the Spanish word ‘hostia’ (silent h) is a general-purpose exclamation used to express an emphatic emotion of some kind. Hadrian’s Wall, eh. Not very long ago I was rereading “Puck of Pook’s Hill”, which has some vivid tales from the Wall, though set more than two centuries after your period. Thank you Jonathan! No I didn’t know about ‘hostia’ – my ignorance of Spanish is vast. I wonder if there’s a connection? The Romans weren’t very original when naming their ports – as you probably know, Ostia was at the mouth of the Tiber and ‘Ostium’ in Latin means ‘door, entrance, mouth’. Even this triumph of creativity was surpassed by the expansion further up the coast – ‘Portus’. Hi. Tabula Rasa was released in the US (the audio version at least) on 8/5/2014. That just happened to be my birthday, and what a wonderful present I gave myself. I had preordered the book and it was available that day. I saved it for my trip to Africa and enjoyed listening to it a little each evening. Simon Vance is the best. The book is a great addition to the series. Waiting for the next one! Great timing, Marie! I’m glad you enjoyed your present. We’re so lucky to have Simon Vance doing the readings! Ruth, That is wonderful news. I will alert the media on our side of the pond and spread the go good news via social media. I’m off to pre-order from Amazon. Jamie, from Across the Pond. Hi Jamie! That’s very kind of you. In fact ‘Tabula Rasa’ came out first in the States – we’re a bit behind the times over here. So it should be immediately available. Hope you enjoy it! Very good news, Ruth – and what excellent timing for a book launch, just the right number of weeks before Saturnalia, I mean Christmas! Does anyone else remember in the dim and bygone days when the media used to proclaim the number of “shopping days to Christmas” …from about August onwards, as I recall. No point now, as one can shop any time. Thank you Jane – yes, I remember those days, but not fondly, being someone who can never decide what people might want and therefore always puts off Christmas shopping in the vague hope that it might be cancelled this year! It is, as I believe Oscar Wilde once said about second marriages, “The triumph of hope over experience”. 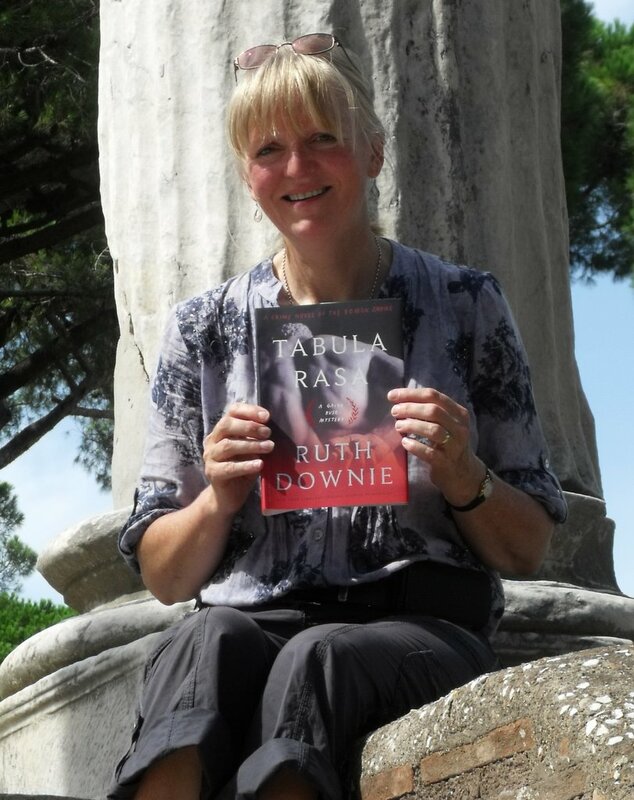 Lynda, I just started Tabula Rasa and like you I’m a fan of Ruth’s work. No spoiler alert required – but Ms. Downie just keeps getting better and better. So, it hit the Kindle store on the 23rd, as predicted, but it’s not yet on iBooks – which is where I have the previous novels. Any word on when it may arrive there? Good question, Adam. I’ll see what I can find out. Sorry you’ve had to wait. Now that’s what I call a healthy attitude! I like that! I’ve now heard from the publishers, who have already sent whatever it is they have to send to Apple, so they will chase. Let me know if it still doesn’t turn up. Hi Lynda – yes, loads to see around the frontier area altho’ you have to have a vivid imagination to picture the Roman ruins as they once were. The folks I met had a fabulous itinerary – http://www.Smithsonian journeys.org/tours/england-mystery but there are lots of other options – try Googling “visit Hadrian’s wall” which will get you some good links. There is a footpath all the way along it if you’re feeling energetic! Temple of Ceres in Ostia 🙂 Is that the point where Ruso and Tilla will begin their adventure in Rome? You identified it just from that one photo? That’s impressive! It’s certainly how Ruso and Tilla will get to Rome (or maybe via Portus) but so far plans for book 7 are… shall we say, fluid? So Ostia itself may or may not appear in the story. I’d love an excuse for a further research trip, though preferably not in August next time. I remembered this place very precisely because I found it very plesant – I was here in the beggining of September (much better for visiting Rome than August) and lied under the pine between theatre and temple of Ceres for about an hour, celebrating genius loci 🙂 My second discovery in Rome this year was remaining of Aqua Claudia near Subaugusta metro station, if you don’t know it, see it next time! There’s interesting blog about new discoveries in Portus (www.portusproject.org) lead by University of Southampton, it should be interesting for you. That sounds wonderful – it’s a lovely place! I’d love to see the Aqua Claudia – Porta Maggiore was on our list of things to see but we ran out of time. The Portus project is indeed fascinating – archaeology on such a massive scale. Did you see the online course Southampton Uni ran with Futurelearn? I think they’re doing it again next summer. And presumably there will be even more to see by then. I don’t know the course, is it aviable from portusproject web page? I only try to read news section from time to time. If you’ll have more time in Rome see Aqua Claudia not only at Porta Maggiore, but also its longest preserved section – you must go metro “A” line, Anagnina direction, get off on Subaugusta station, then go south-west four hundred meters the Titus Labienus street, then go to the park, cross less delightful renaissance Aqua Felix and after next three hundred meters south you’ll meet breathtaking mile-long roman aqueduct! And – pracitacaly no people around! I also reccomend less known Museum of Roman Civilization in EUR ditrict – they have one of biggest maquettes of ancient Rome (unfortunately it was closed this autumn, but I hope it’ll be reopened till next spring). Thanks Pawel – I’ll definitely go aqueduct-hunting next time: it sounds wonderful. Also the Museum – closed when we were there too. The course was run under the Futurelearn system, where there are all sorts of interesting and time-consuming University level courses for free Coursera is the American equivalent, and both should be easily found by Google. I am deliberately avoiding both at the moment as I have a book to write and am too easily distracted! I visited Hadrian’s Wall last year on a visit to the UK and enjoyed it very much. One day I would like to return and walk the wall. Thank you Fr. J, I’m so glad you enjoyed it! Hopefully Tabula Rasa doesn’t give away too much about the earlier plots. I try to be a bit vague about “what happened before” but some things are unavoidable. I hope you get the chance to walk the Wall before long, too. If you’re interested in exploring further online, Newcastle Uni are running their free Futurelearn course about the Wall again in January. But be warned: it is addictive.